This is what Milner [a Lacanian theoretic of the „New Antisemitism“] is aiming at all along — this Europe, in its advocacy of unlimited openness and multicultural tolerance, again needs the figure of the „Jew“ as a structural obstacle to this drive toward unlimited unification […]: in early modern anti-Semitism (exemplified by the name of Fichte), the Jews were denounced for their limitation, for sticking to their particular way of life, for their refusal to dissolve their identity in the unlimited field of modern secular citizenship. With late-nineteenth-century chauvinist imperialism, the logic was inverted: the Jews were perceived as cosmopolitan, as the embodiment of an unlimited, „deracinated“ existence which, like a cancerous intruder, threatens to dissolve the identity of every particular-limited ethnic community. Today, however, with the move toward the post-Nation-State globalization whose political expression is an unlimited Empire, the Jews are again cast in the role of being stuck onto a Limit, a particular identity — they are increasingly perceived as the obstacle on the path toward unification (not only of Europe, but also of Europe and the Arab world). Moslems als die Juden von heute? Oder was sollen wir uns aus diesem unkommentierten Beitrag ziehen? Was ist „alles andere als unproblematisch“? 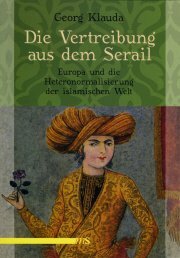 An manchen Stellen schwingt in diesem Blog immer mit, dass man aus der Islamfeindlichkeit den neuen Antisemitismus macht; was früher die jüdische Großfamilie war, sei heute das Bild der islamischen etc. Dieser Floh springt mir in deutlich zu vielen Ohren rum. Da ist der gute Zizek wohl auf die buergerliche Rede von der „Globalisierung“ reingefallen.